That's the refrain of a Wilco song that has been stuck in my head for the past week - perhaps for good reason - as I continue on - make more things - dye more yarn and fiber - get another fiber club shipment out. I don't mean to make it sound boring, it actually is refreshing to have a sense of routine. To have an internal timer go off, and say fiber club, must get to it. Rather than looking at the calendar, and saying, oh sh*t, the fiber club - or whatever it happens to be that day. I finished the Clothilde - and gifted it to my great friend Michelle - she had a birthday. I knit this out of AVFKW Wishing yarn, in Crocodile Tears. 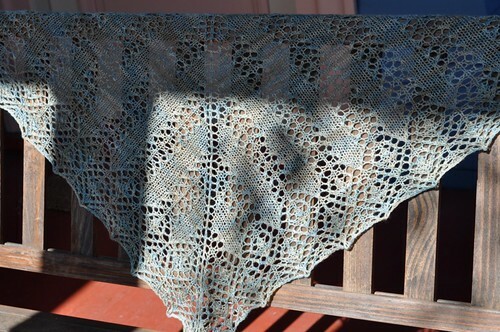 Also, I have started a new project, The Nightingale Wing, by Anne Hanson aka Knitspot. For the past few months, Anne has been working with our yarn, Holding, 100% alpaca, to create a pattern. I have watched via blogland, her add a few rows here and there, in anticipation for the blocking. The time finally came in late August. 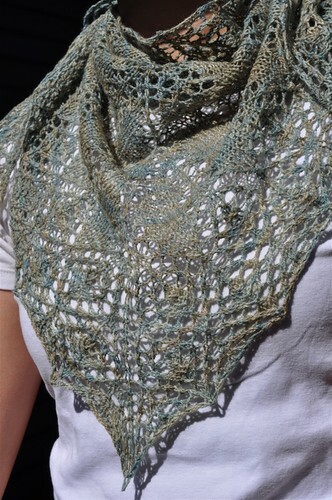 From following Anne on her blog, I began to realize that this weight of yarn and the fiber content, alpaca, is a bit on the light side typical to Anne's designs. Yet, seeing it amongst her body of work, it is great to see a piece so light. This piece reminds me of paper. I absolutely love how it turned out. Here is a photo that was featured on Anne's blog. All photo credits go to Anne and David. Here is a photo of my progress so far. I really love this pattern. The border graphs are more complex then the center panel. i like this, it reminds of the way that sari fabric is designed. Plus, it means that 80% of the stole is pretty easy to knit, and the other 20% grabs my attention, and keeps the shawl interesting to knit. Plus! It is knit in one piece. I know, I know, grafting is part of life, but sometimes, I just like to bury my head under the sand and knit. Which brings to mind something else, we are beginning to offer knitting classes at Verb. I am so excited about both classes. First, we are offering a class that teaches Elizabeth Zimmerman's Percentage System - what does this mean? In a nutshell, you will learn how to create a sweater that fits your body, as exactly as you'd like. 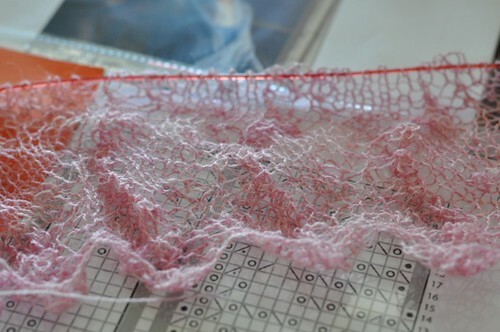 Karen, the teacher, was in the shop yesterday talking to one of the students - basically, you can bring in any idea that you have, cables, lace, cardigan (hello, steeking, great chance to learn) and Karen will teach you how to create the pattern. And, you can bring in what ever kind of yarn that you'd like - handspun, stash dive, I have also just stocked the verb store with a bunch of beautiful yarns from Wendy at Shaggy Bear - a wide range of natural colors, grown and spun right here on the West Coast. Also, Marlowe, is teaching people how to use her Basic Shaped Arch sock pattern. I have knit 3x as many socks from using Marlowe's pattern. The shaping through the foot creates a very snug fitting sock, my favorite kind, and the shaping in the foot keeps my mind busy, makes the time fly by, and voila I am at the toe and grafting (see! I do graft!). Even if you've knit a couple sock, and you are bit unsure if you like to knit them, c'mon by, and give it another try. She might hook you... click here to learn more.